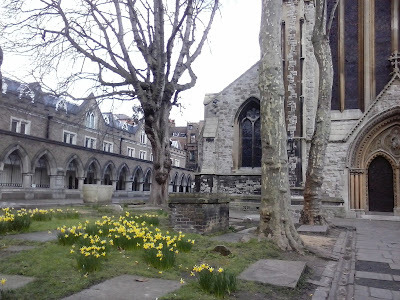 I've never found St Mary Abbots open, but that's undoubtedly because I've mostly tried after work or in my lunchbreaks. According to the website they open three times a day for prayer, which is more than reasonable. 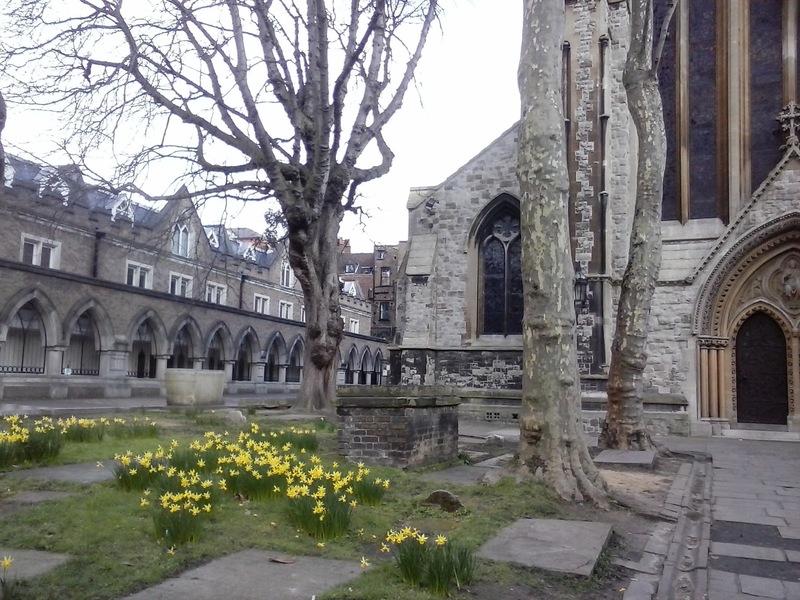 Outside is very pleasant indeed, the churchyard and public gardens making a small quiet space just off Kensington High Street. On the same site is a primary school of the same name, and although you can't see it from this angle there are hopscotch squares and other children's pavement games painted just this side of those cloisters. in the churchyard caught my eye. The main entrance of the church is on Kensington High Street, with a flower stall outside it (actually if you walk the length of the High Street there are 3 flower stalls, not counting the one in the station arcade) and a war memorial I want to photograph but can never get a good shot of because it would have to be taken from across the road, and it's just too busy. 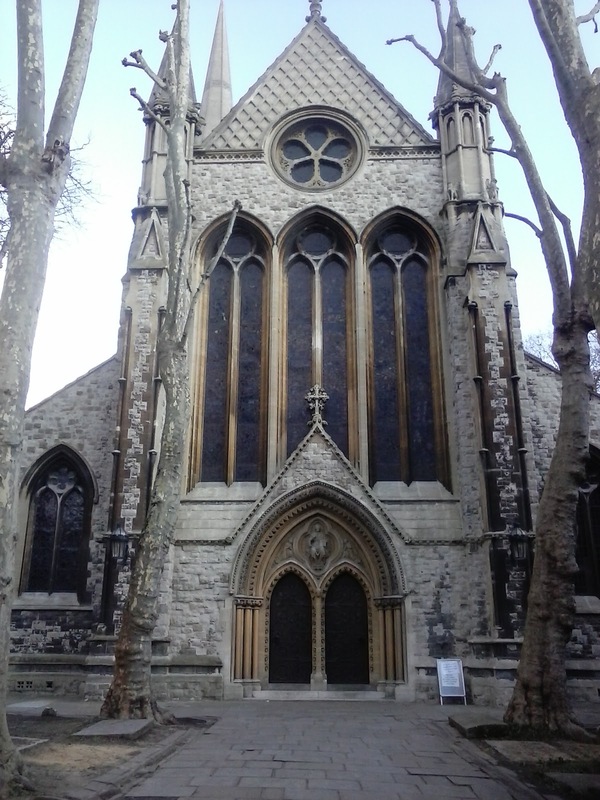 The building itself appears to be a solidly built Victorian church, and was constructed in response to the increasing population in the parish. The old church, which was pulled down to make way for it, is pictured on the British History Online website here (you need to scroll about halfway down the page). Another church I've never been in, and in this case I don't suppose I ever will, is St Sarkis, otherwise known as the Armenian Church. 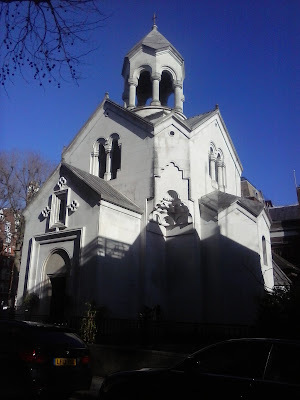 St Sarkis is tucked away over the other side of Kensington High Street in Iverna Gardens. It's on the way to Earls Court (avoiding Earls Court Rd, which is much less pleasant to walk down) and that's how it caught my eye. It's small for a church and was built in the 20s, to the memory of the parents of the man who put up the money, but for the use of the growing Armenian community in London at the time. A little gem in Portland Stone that I'm not sure ever opens at all. More information at Historic England here.